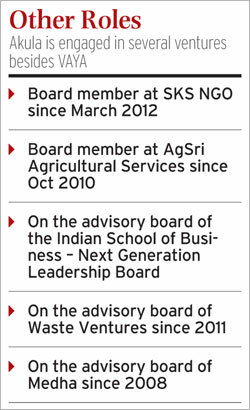 He founded SKS Microfinance but had to exit it. Vikram Akula is now back with Vaya Finserv. On January 29, the board of SKS Microfinance, the country's only listed microfinance entity, approved the company's proposal to apply for a licence to set up a small finance bank, a new category of lenders that the Reserve Bank of India has created to drive financial inclusion. 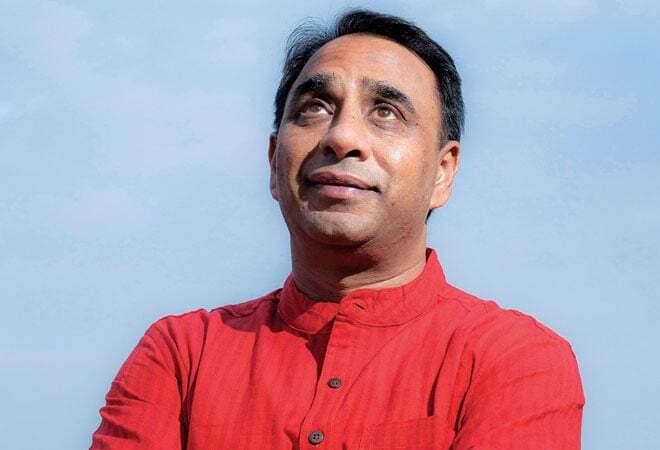 A few kilometres away from the SKS office in Hyderabad, Vikram Akula, who founded the company in 1997 and had to unceremoniously exit in 2011, is giving final touches to the application for a small finance bank for his start-up VAYA Finserv. Though the top brass of SKS and VAYA do not wish to talk about each other, they are poles apart in size. 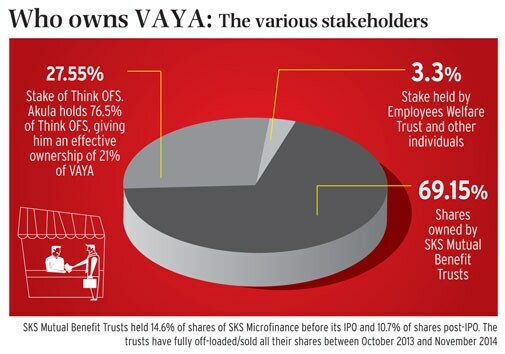 While SKS has over 50 lakh clients, VAYA has just 9,883. Bandhan, the industry leader, has 61 lakh borrowers. Industry watchers say Akula had made unsuccessful attempts to get back on the SKS board, but Akula denies that. "I was asked by a set of shareholders if I would consider coming back and joining the board. To that I said, 'yes, I would be delighted'. Finally, the overall shareholders decided against. It was not me asking to be put back on the SKS board," he says. He is now talking about lending to the poor like he used to when he was with SKS. Reason: He is now free from the three-year non-compete pact he had entered with SKS on November 23, 2011. But can he do it all over again? "The key learning from my experience has been the importance of preserving the ethos and culture of a social enterprise as it scales. It is critical to be thoughtful about everything from the type of investors you bring in to the rewards and recognition you give to your last mile field staff. I am incorporating these lessons in VAYA," he stated. But others in the industry were more forthright. Many who have known him or watched him over the years, without wanting to be identified, say he misjudged the extent to which Indian opinion leaders would accept the for-profit model to serve the poor. According to them, the opinion leaders were upset when Akula said that he will attract billions of dollars for microfinance by ensuring "extreme profits" for the investors. Some feel with success he got a bit arrogant, thought he and his creation, SKS, were invincible and did not take the local government seriously. A case in point was the client protection issues that SKS (being a leader then) did not address adequately. Those who have worked with Akula earlier see in him a penchant for micro-managing especially when dealing with the senior leadership. According to his peers, if Akula succeeds in building a good team that can showcase the impact of his work with the poor, it could build faith in him among the regulators and stakeholders. They also say that Akula could do well if he focuses on risks, especially because VAYA at this stage is more dependent on bank funding than SKS was. VAYA is a business correspondent (an entity allowed to act as intermediary to collect deposits and offer loans on behalf of a bank in remote areas) and every loan needs to be approved by the banks, who according to Akula's peers in microfinance institutions (MFIs), "can be quite whimsical". If VAYA is going to be his springboard into future, then no doubt Akula has his task cut out. In the last three years, Akula was doing anything but microfinance thanks to the non-compete agreement. In this period, he came across as a man in search of a cause. He would talk on myriad topics such as sustainable way to grow sugarcane, leveraging mobile technology to offer services to the poor or setting up schools. If nothing these, then he addresses social entrepreneurs on the lessons he had learnt. But in December, after the expiry of the agreement, he took a stake in VAYA Finserv, a business correspondent promoted by SKS Mutual Benefit Trusts, which had exited SKS. "After SKS, Akula came across as a man in search of a cause. We found him trying to address a variety of causes perhaps because he was not allowed to get involved in microfinance. But now, he seems to have got back to microfinance with this new entity," says Sanjay Sinha, managing director of Micro-Credit Ratings International Ltd (M-CRIL), a company involved in financial ratings of MFIs and providing sectoral advisory services. Akula says he was not at all out of focus. "While all the things that I have been focusing on in the last three years may seem disparate, they are not. They are in some form or the other linked to social enterprise and financial inclusion," he says sitting at what was once his SKS office in Banjara Hills, Hyderabad. He says that in the last two years while he was not into microfinance, "the passion for and the commitment to financial inclusion was always there". "It has driven my career then and now. But since I could not sit idle, I decided to support other social entrepreneurs," he says. But now he is back to doing what he knows very well - working in the financial inclusion space. VAYA was set up in March 2014 and has a loan portfolio of Rs 22 crore (as of January 31, 2015). It has a total staff strength of 240, some of them are ex-SKS employees. "Our goal is to work in the unbanked districts. If we get a small bank licence, we will do it in the form of a small bank. If we don't, it will be a long shot for us. All said and done, it's a start-up and will do it as a business correspondent," says Akula. He is quick to add that he prefers to work as a bank. "Because we think we can have lower cost of funds and there will be more operational freedom to offer a full range of services such as loans, savings, insurance and pension. I am known as a loan person. What I would like to provide is a safe place for the poor person to save," he says. But despite the grand designs, VAYA will not be Akula's full-time occupation. He says he has personal and family commitments that demand his presence in the US for the next five years or so. Though as the Chairperson, he will focus on VAYA, he will have to spend his time between India and the US. The entity has a senior management team led by MD and CEO Jagadish Ramadugu, CFO Lakshmi Narayanan and CTO G.V. 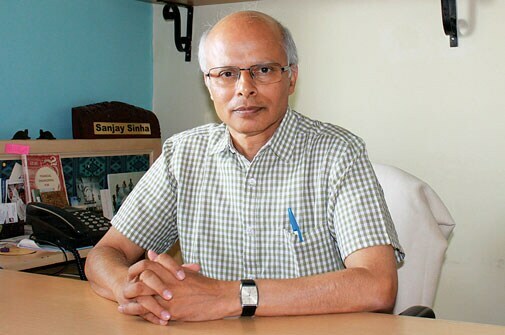 Surya Kumar. 'Given Vikram's well-known aspirations, his contacts and the ability to raise money, he could, at least in theory, emerge as a significant player,' says Sanjay Sinha, Managing Director, M-CRIL. Currently, VAYA is a business correspondent working with YES Bank in seven districts of north Karnataka and eastern Maharashtra. It has just launched services in 10 districts in Bihar, four in Jharkhand and three in Odisha. The company did not divulge details of its exact capital due to "confidentiality restrictions" but argues, "the small bank guidelines require Rs 100 crore". The promoter group need not have the capital in place but needs to indicate where the capital will come from, it says. While he was in SKS, Akula would often talk about making it the Google at the bottom of the pyramid. "I could execute this vision at SKS. Now I have to start from scratch and need to build that platform," he says. S. Viswanatha Prasad, Managing Director, Caspian Impact Investment Adviser, who has invested in many leading MFIs, says, "Business at the bottom of the pyramid needs to take multiple stakeholders, including the local governments with them on their business idea. Blatant profit maximisation, even if it is only a perception, will hurt the businesses. This is what SKS and other large MFIs could have done better to avoid the public backlash." As for Akula, he says, "At VAYA, he now seems to have got back to what he is good at - dealing with customers at the bottom of the pyramid. The business of financial inclusion is what he understands best and now having learnt from his mistakes, hopefully, he will do things differently this time." So can Akula create an impact? Sinha at M-CRIL says: "Given his well-known aspirations, his contacts and the ability to raise money, he could, at least in theory, emerge as a significant player in microfinance in the future. However, given the history with SKS in the past, he will face significant challenges in terms of bankers and regulators perceptions." Akula is apparently aware of his challenges and the distance he needs to cover. "It took me 13 years to take SKS from start to IPO, give me 13 months to at least to get some traction here," says Akula. Today, even Akula's worst critics say that he has done something right to bounce back. But then, can he emulate Bandhan? Doubtful, say microfinance experts. Reason: Bandhan's genetic code, they say, is much more spartan and street-smart.